Watermarx Graphics recently printed this delicious invite for the delicious. Produce Awards held at celebrated restaurant, Bennelong, at the Sydney Opera House. This tasty piece served up a smorgasbord of things we are true connoisseurs of; embellishments. 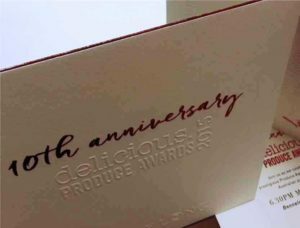 The Awards invite included included rich, juicy foiling, served up with embossing (using our talk-about CLIQX system) and yummy letterpress printing, garnished with a lick of edge gilding. What a crowd-pleaser! The awards are delicious. Magazine’s showcase of Australia’s finest producers of food from the sea, paddocks, earth and artisan food makers. They had a menu to make your saliva glands work overtime as you read it, and guests gobbled the best food the country has to offer. Now in its 10th year, the awards are highlight for antipodean foodies, and the we think the invitation offered a visual feast to suit! Let us know if we can help you turn your event invite into a treat.